If the Kelowna Rockets were Superman, the Prince George Cougars would be its Kryptonite. The Cougars have something in their game that makes life miserable for a Rockets team that is 2-3-1-1 against their BC Division cousins. The Cougars most dominating performance in the seasonal series came last night at CN Centre in a lopsided 7-2 win. The Cougars chased starting goaltender Roman Basran by scoring three times on its opening 11 shots and cruised to victory. It was the Cougars first game on home ice following 11 straight on the road. Sadly, it looked like the Rockets had been on the road for over a month, not the Cougars, with what can only be described as a sluggish effort. The visitors looked tired or uninspired. I can't put my finger as to the reason why? It was a costly loss. It allowed the Cougars back into the playoff hunt. 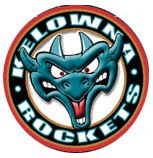 The Rockets now lead Prince George by only 5 points for third place in the BC Division while falling out of contention for second place with the Victoria Royals. The Royals are now 7 points ahead after a 4-1 home ice win against Kamloops. Victoria still has three games in hand. The last time the Rockets lost by 5 goals in Prince George was October 27, 2001 in a 8-3 loss. Bart Rushmer, Tyler Mosienko and Carsen Germyn scored in the setback. Last night's game is one where you must quickly flush it out of your system. You didn't execute. You didn't compete. Simply flush it down the toilet and move on. It was a night where errors were magnified and few bright spots were available to build on heading into the rematch tonight. Leif Mattson and Nolan Foote scored power play goals to make it somewhat respectable, but even the shot clock wouldn't lie with the visitors generating only 5 shots in the opening 27 minutes of the game. After firing only 10 pucks on net in the first-two periods, the Rockets were able to equal that total in the final period in their 20th loss of the season. As an observer, I am always looking for answers on how the team can show up so flat. I wonder if Thursday's WHL trade deadline had anything to do with it? Did it take an emotional toll on the team and did that translate into a sub par effort a night later? Or did the loss to the Everett Silvertips Wednesday night somehow diminish the confidence of the team? Again, I am simply asking the questions and searching, with no avail, for the answers. The Cougars were able to get secondary scoring with three goals coming from defencemen. Cole Moberg scored twice and looked like a modern day Dan Hamhuis. Even rookie d-man Jack Sanders scored his first goal of the season in a game where everything went wrong for the visitors and everything went right for the home team. Even blind shots from the blue line seemed to find its way into the back of the net. 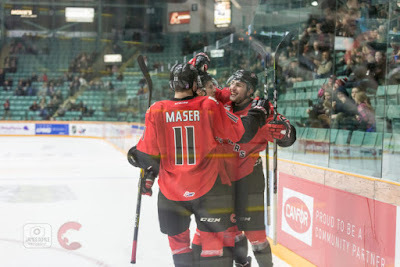 Josh Maser, who many teams likely called Cougars GM Mark Lamb and inquired about the obtaining the former 28 goal man, scored twice in the game that took just 2 hours and 19 minutes to play. While it was great to see the Rockets score a pair of power play goals, the real concern is generating offense even strength and finding goals from anyone not named Leif Mattson, Nolan Foote and leading scorer Kyle Topping. Those three, who make up the top line, have scored 54 times between them or have contributed 52% of the teams goals this season. With 104 goals scored this season and 27 games left on the schedule, the team is flirting with a franchise record for offensive futility. The Rockets scored a franchise low 156 goals during the 2006-2007 season. This years edition is 52 goals shy of that mark. 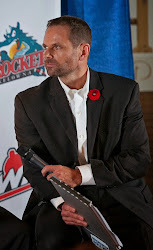 Averaging 2.5 goals per game this season and having scored just 43 times in their past 20 games (2.15 per game), the 2018-2019 edition will have to pick up the pace in order to avoid the distinction of being the lowest scoring team the Rockets have ever iced. Leif Mattson collected a goal and had an assist in his 150th career WHL game. Mattson has 4 goals and 10 points in the seasonal series. Cayde Augustine was back in the line-up after being a health scratch after the Christmas break. It was Augustine's first game since December 15th in Medicine Hat. Newly acquired defenceman Schael Higson was involved in a late third period fight with Cougars forward Connor Bowie. It was Bowie's first major of the season. Higson played the game alongside d-partner Kaedan Korczak. Since a 4-3 overtime road loss to the Cougars back on November 14th, the team has scored just 21 goals in their last 11 road games (1.9 goals per game). We have the rematch tonight on AM 1150. We will start things off with 'The Kelowna Rockets This Week' at 6 pm as we look back at Tyson Barrie's record setting effort with the Colorado Avalanche and colour analyst Kent Simpson joins us for another installment of 'Simpson Says'. 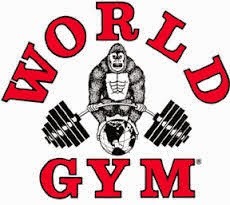 Memorial Cup next year!! Mmmmm???? I sure hope Bruce can pull a rabbit out of his hat because the current team he has assembled is not going to do it!! !